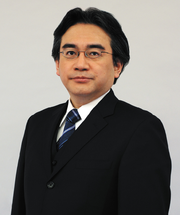 Satoru Iwata (岩田 聡) was the fourth president of Nintendo, and the first Nintendo president not related to the previous presidents by blood or marriage. He contributed to the GameCube and was responsible for its success. He was also the executive producer of many games and a previous employee of HAL Laboratory. In April 2013, he replaced Tatsumi Kimishima as CEO of Nintendo of America. He died on July 11, 2015 of a bile duct growth after a long battle with cancer. Tatsumi Kimishima succeeded him in presidency. Iwata's cameo in WarioWare, Inc.: Mega Microgame$! He makes cameos in a number of Nintendo games, but the most notable appearances are in WarioWare, Inc.: Mega Microgame$!, where he appears on Wario's TV, and in WarioWare: Smooth Moves, where he (under the name Shop Manager Iwata) is the owner of a video game store and sold 18-Volt a Game & Watch for 9-Volt. Whenever the player wins a microgame in 9-Volt and 18-Volt's set, he takes away his ? Block set and chuckles, and if the player loses a microgame, he becomes slightly frustrated and a customer leaves the store (which are the life counters). A copy of 1984's Golf is embedded in Nintendo Switch firmware. Activating it requires the internal system clock to be set to July 11 - Satoru Iwata's death anniversary - and performing his iconic "directly to you" hand gesture with both Joy-Con controllers on the HOME Menu. If successful, a voice clip of Iwata from a Japanese 2012 presentation will confirm the input, and an emulator of Golf with added motion control support will promptly boot up. Golf has significance as one of the first video games Iwata programmed himself for Nintendo while working at HAL Laboratory. This version of Golf was overwritten as of the 4.0.0 update, making it unplayable. Since Satoru Iwata was automatically credited as "Executive Producer" on every Nintendo game released between his promotion to president and his passing, the following list cover only credits given before said promotion. ↑ Notification of Death and Personnel Change of a Representative Director(President) (July 13, 2015). Nintendo.jp. Retrieved July 13, 2015. This page was last edited on September 7, 2018, at 02:43.